Update full will block. Modern fashion along with forms similar to figure offers clothing voluminous and comfortable. This creates difficulties when upgrading because the old products are generally narrow and short. Manufacture of a new product of the same range requires a large amount of fabric finishing. But if the old product has a large number of carved lines to update it so it is simply impossible. Most appropriate in these circumstances and very interesting is the option to upgrade with a full block. With this update you can use all the old coats, different coats, suits, dresses and even men's suits and shirts. Will not remain without attention and knitwear - jumpers, sweaters, dresses, etc., especially if they are interesting in color and texture. What can be done with a coat or short coat? Very much. Coat of a more dense tissue can be reshaped into a jacket, blouson, or at least a vest, if a large number of carved lines and great wear and tear prevent tell. Coat and short coat of light-weight fabrics can be changed into a sundress, dress, coat, skirt. Of wool dress out skirt, blouse or dress, silk blouse. Dress of knitted fabric can be reshaped in a closed swimsuit or two piece swimsuit bikini. Old cloak, male and female, can be converted into a jacket, blouson, dress, fashion long skirt, vest. To update woman's wardrobe can be used and men's suits. Of men's trousers out chetyrehchastnaya skirt, if the hip measurement is not more than 100 cm, and the jacket is the classic jacket, Spencer, or vest. The fashion in recent years offers a variety of dress-coat. Of particular interest are the dress-a classic coat style. The idea can be used when overlapping the male costume. 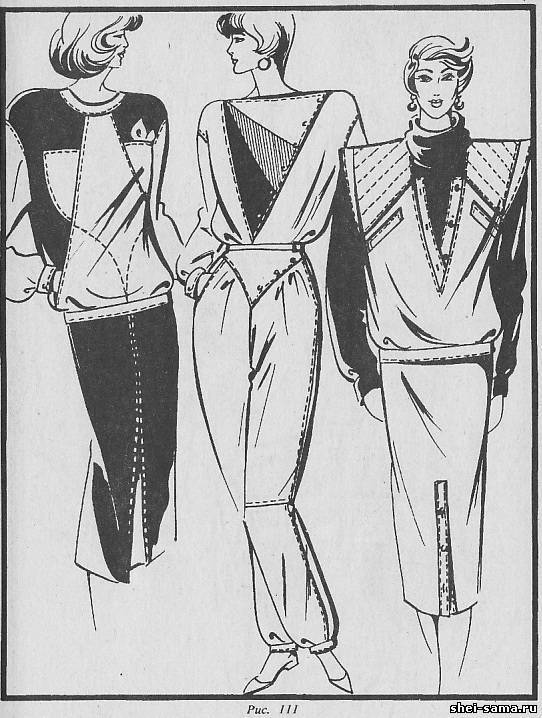 In this case, from the jacket cut out bodice dress, pants skirt. From the men's costume, you can sew trendy overalls or bib for a young girl. Redrawing dress-up costume, you can receive the dress, dress, fashion long skirt, jacket or blouse. From easily men's shirts cut out women blouse in classic style, men's briefs, apron. If necessary, the outdated women's and men's products can be redraw in children, i.e. to sew a coat, jacket, blouson, shirt, skirt, Romper, bib. To spice up the products to make them more colorful, you can use a bright finish, metal accessories etc. If obsolete product have a large number of carved lines, if they are small and there is no extra fabric, a good solution may suggest a new direction in fashion, the so-called patchwork solution, i.e. the preparation of products of separate pieces-flap, varied in texture and color. A compilation of patches can be symmetrical and asymmetrical. To make therefore, you can blouson, vest and even dress. For this purpose, use obsolete product ranges. Important to choose well the fabric density, texture and color.Old jumper bright color can liven up a new product patchwork solutions sonorous color spots. 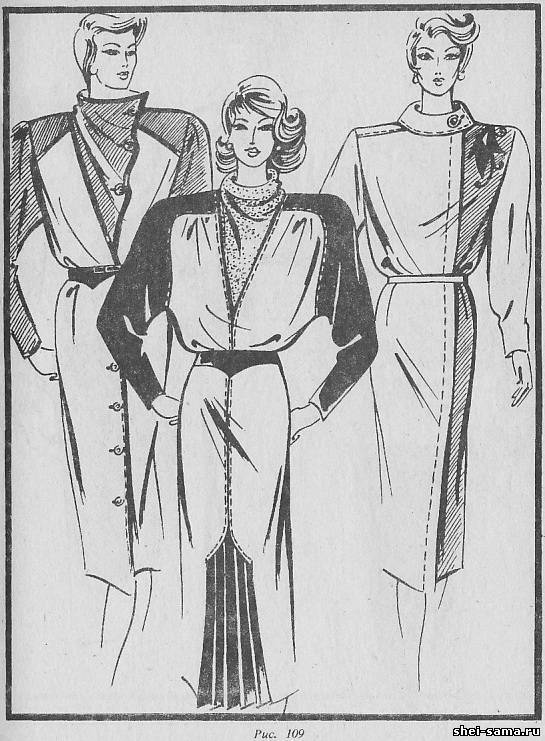 Figure 107 shows the options of clothes made in this way. 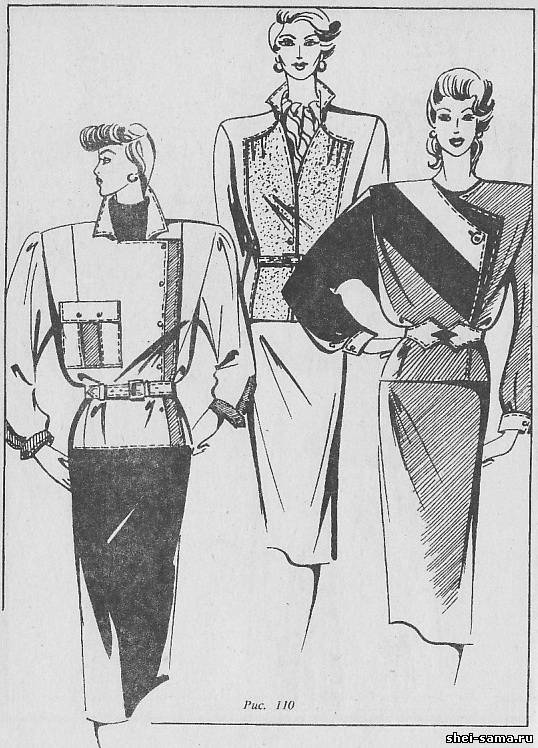 Modern fashion is based on creating clothing in the kit. This idea may suggest an original way to upgrade clothes. Jackets, shirts, jackets, tunics, jumpsuits, skirts and blouses, made from obsolete products, through the selection of color and nature can be combined in a variety of kits. Kits can be for different purposes: business and sportswear, dressy and comfortable. They can consist of two, three or more products. The jacket can be worn with a skirt and blouse, dress with blouse and jacket, 6лузон - with a blouse and overalls. The assortment of modern clothing has expanded considerably. A completely new product names, unknown earlier. In the group of jackets is shirts, anoraks, parkas, Spencer. Fashion pants are available in various lengths, Along with long, straight-shaped fashion offers pants tapered-leg pants form of breeches, trousers, pantaloons, forms a kilt. Trendy vests are also of different length, from short, like Figaro, to an elongated, covering of the thigh. New fashion range designed for young people. Products in this range also good to redraw from the old one. Very important in the creation kit is the interchangeability of its parts. The blouse can be worn with pants, skirts, rompers, blouson with skirt, pants or dress, etc. 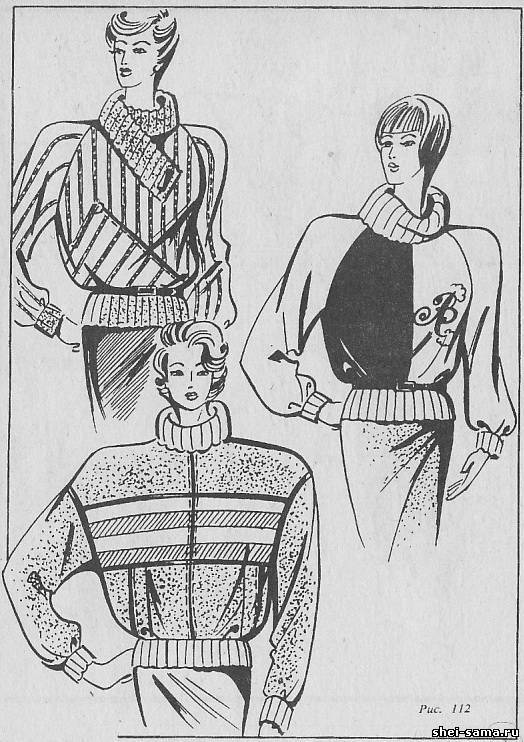 In figures 108-111 given the options of dresses and sets, the resulting full overlapping old products. Structural bases for their implementation are given in the section "Design patterns". 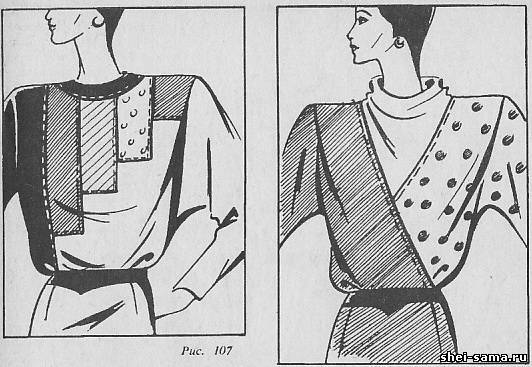 With knitted parts offered blouses in figure 112. 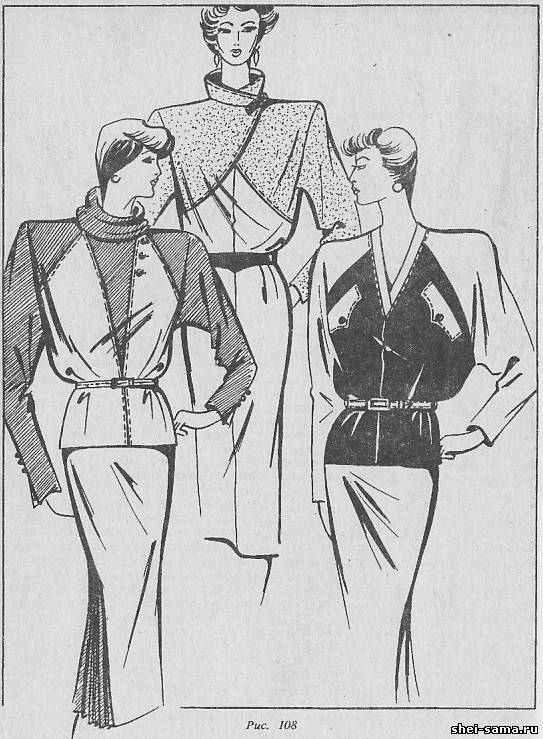 Various styles of skirts that can be performed from the old men's or women's Cape, shown in figure 113. If the fabric is old product is not enough, some details can be cut out of other fabric or material (contrasting colors or tone on tone), using for this purpose the effect of the contrast of textures (for example: add fabric embossed weave, leather, suede, knitted fabric). 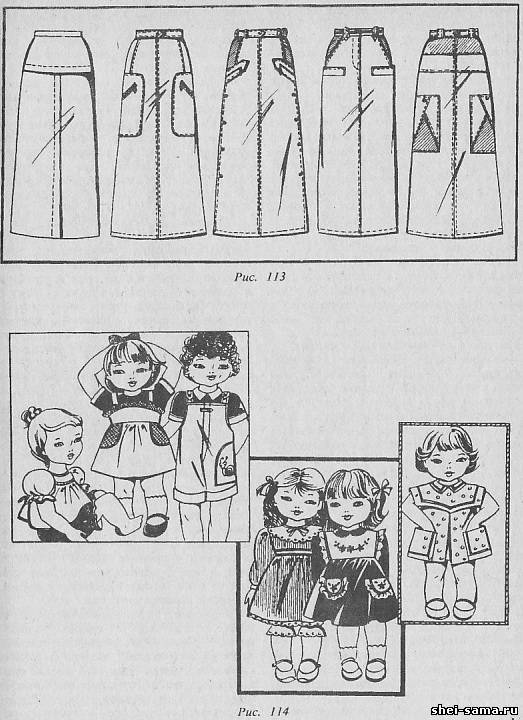 Figure 114 shows the models for the little ones, which by overlapping received from my mother's blouse, skirt, sundress. They can also perform remaining after overlapping pieces of several products.